I had the honour of being invited to show at our local art gallery during their Winter Festival of the Arts Show. It was open to local artists and 92 submitted works in many different styles, mediums and sizes. I had difficulty deciding what to paint. As a landscape painter you'd think "growth" would be a natural stimulation but getting to the right image was a bit of a struggle especially since I wanted to do a bigger painting. I actually started 3 works, all bigger than what I ended up with but in the end I went back to my smaller works to see if I could get an idea. I settled on one I did last year but I wanted to get more mood into it. Spring on St. Joe's by Warren Peterson 8" x 12"
"Spring on St. Joe's" was done as a stand-alone painting. It depicts a scene that I saw while driving down a country road near or cottage on St. Joseph Island in northern Ontario. It's full of lush forests and mature hardwood trees framed by local farms and maple syrup production. I see a lot of mystery in these woods and every Spring they come back to life providing a safe haven for the local wildlife including many White Tail Deer that live on this large island on Lake Huron. 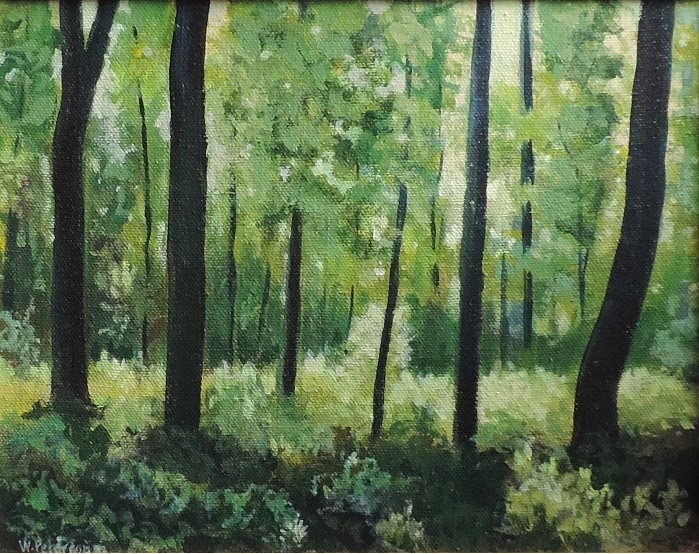 I wanted to paint an image that was seductive, full of the new undergrowth that seems like a sea of green. 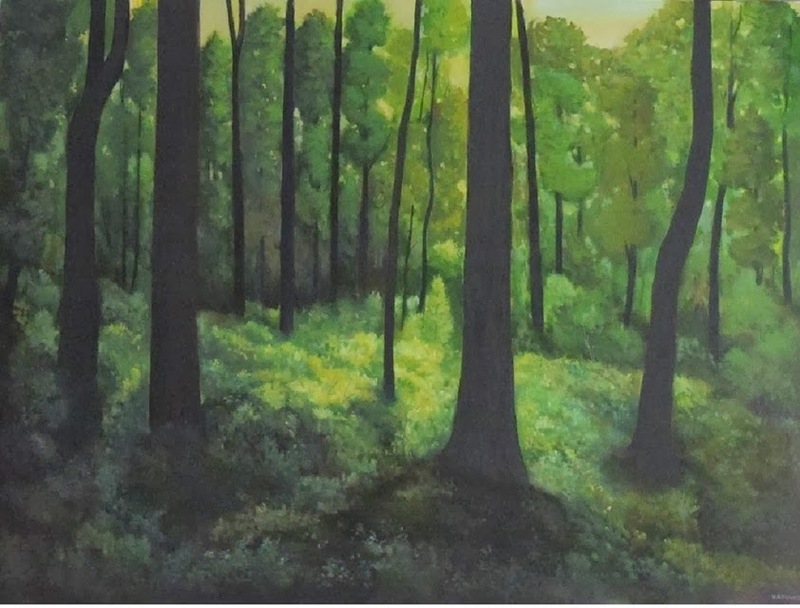 I also wanted a painting that would invite you into my wilderness world where a short walk in the bush could get you lost for days if you're not careful. My final work, called " A New Year" is a culmination of the sights, sounds, smells and wilderness "quiet" that one gets while out in real Nature, not some groomed park. I want to temp you to take that walk into the bush to see what's beyond the tree line in the distance. Look up and you may be able to see the tops of these large Maples. More importantly look down to see all the new life that springs up each year. Some of these may become new trees that in a hundred years' time other artists may marvel at and paint for future generations. "A New Year" by Warren Peterson 36" x 48"
Here I am next to it during the opening reception at the show.